Semiconductor physics, quantum electronics and optoelectronics, 21 (3), P. 225-230 (2018). Semiconductor physics, quantum electronics and optoelectronics, 21 (3), P. 231-237 (2018). Semiconductor physics, quantum electronics and optoelectronics, 21 (3), P. 238-248 (2018). Semiconductor physics, quantum electronics and optoelectronics, 21 (3), P. 249-255 (2018). Semiconductor physics, quantum electronics and optoelectronics, 21 (3), P. 256-262 (2018). Semiconductor physics, quantum electronics and optoelectronics, 21 (3), P. 263-272 (2018). Semiconductor physics, quantum electronics and optoelectronics, 21 (3), P. 273-276 (2018). Semiconductor physics, quantum electronics and optoelectronics, 21 (3), P. 277-281 (2018). Semiconductor physics, quantum electronics and optoelectronics, 21 (3), P. 282-287 (2018). Semiconductor physics, quantum electronics and optoelectronics, 21 (3), P. 288-293 (2018). Semiconductor physics, quantum electronics and optoelectronics, 21 (3), P. 294-306 (2018). 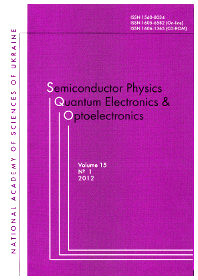 Semiconductor physics, quantum electronics and optoelectronics, 21 (3), P. 307-314 (2018). Semiconductor physics, quantum electronics and optoelectronics, 21 (3), P. 315 (2018). Semiconductor physics, quantum electronics and optoelectronics, 21 (3), P. 316 (2018).